There are two common first reactions when you tell any homeowner about the risks of bed bugs. First, there is a sense of disbelief that these creatures really do exist, and then there’s an instant skin-crawling feeling at the idea of these creatures in our mattresses. 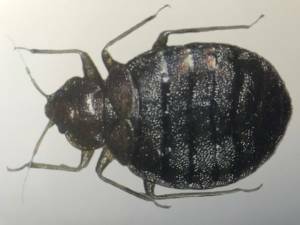 Understandably, we don’t want any creatures to get close to us while we sleep, but there are additional problems with the bed bug that mean that professional extermination is the only solution. The key is knowing when you have a problem, and who to call. So what are bed bugs and why should we be aware of these potential pests? In reality, this is not a monster of nightmares. These bugs are small, 5mm insects that are dark red to brown in colour and really do live in mattresses hence the name. They are blood-sucking pests that will crawl out of their hiding places to feed on the warm, bare skin of people as they sleep. There isn’t much to fear from the bites, apart from a small itchy swelling, but nobody wants to share their bed with these creatures. The main issue here is that these pests go deep in mattresses and other types of upholstery, carpets and curtains. The additional problems are that they can be difficult to detect and they reproduce in large numbers. Unlike other creatures that need to feed each night, these bugs can lie dormant between feeds for up to a year or more. In this period, the colony can swell in numbers, completely unnoticed. A single female can be responsible for as many as 500 eggs. Yet, they take a while to mature and may not be seen. In fact, the first sign of bed bugs may be spots of blood on the sheets, rather than any signs of the bugs themselves. The problem with this level of deep, large-scale infestation is that it is difficult to deal with it single-handedly. There are measures you can take to improve a situation, but a full eradication is unlikely. Professional steam treatment of carpets and mattresses may help, to begin with, this can help to prepare the surfaces and launch the first stage of the attack. Yet, simply spraying these surfaces won’t be enough to get deep down into the mattress. At the very least, strip and hot wash all the covers and linen to give the professionals a better chance. The difficulty in eradicating these pests is why you need to call upon the experts for the best possible bed bug treatment. You need a knowledgeable, experienced team when it comes to these little critters because of the impact on the home and the difficulty in getting rid of them all. There are different techniques employed here. A thorough vacuuming is a very important part of a quality bed bug treatment. The first is a thorough vacuuming of the mattress and carpet, followed by a non-toxic spray on the skirting boards and other crevices where these bugs may linger. They will blow the dust in the gaps to make sure every potential area of infestation is covered. Another effective way to kill bed bugs is with the use of specialist heat treatment units. Affected rooms are heated up to a temperature of 50 degrees Celsius. The room must remain at that temperature for about 1 hour to kill all stages of the bedbugs life cycle. A Bed bug heat treatment should only be carried out by a trained professional. Some bed bug problems may require the use of both chemical and heat treatment. This sequence highlights the need for a professional team like Sunnystate Pest Control to carry out a successful treatment. These methods have to occur in this order and must be carried out with care and precision – as well as with precisely the right tools.